Recently, China has been doing something that’s caught the attention of the U.S. intelligence services. In the South China Sea, in the Spratly Islands chain, China has been developing airfields, ports, and other facilities across the face of many of its man-made islands. “The South China Sea is one of the world’s most contested regions. The body of water is subject to competing territorial claims by China and several other countries in Southeast Asia, including Vietnam, the Philippines, Brunei, Malaysia, Taiwan, and most recently, Indonesia. Though social mood is trending positively in many of these nations, a trend toward negative social mood in China, which claims more than 80% of the Sea’s territory, is fueling the potential for serious conflict to erupt. “In recent years, China has seized many areas of the South China Sea that had been claimed by other nations. 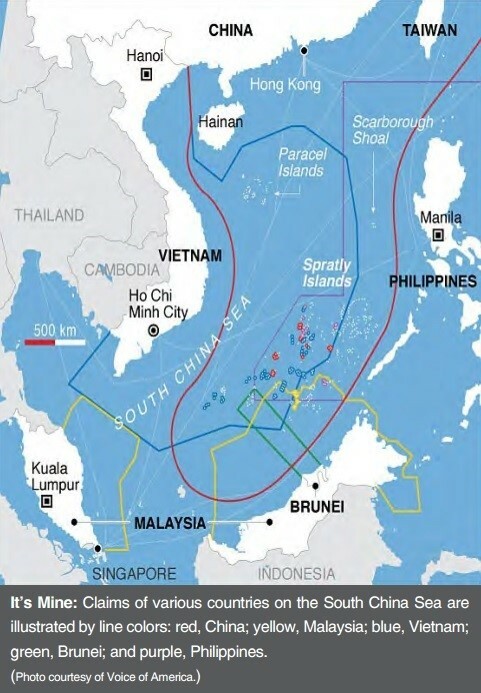 In 2012, China took the uninhabited Scarborough Shoal from the Philippines. In 2014, it placed an oilrig within waters claimed by Vietnam. Why is the South China Sea so important? Besides being one of the most important trade routes in the world, with at least $5 trillion of commercial goods passing through the channel each year, it is also a mecca — or at least thought to be — for oil and gas reserves. The U.S. Department of Energy estimates that there are over 11 billion barrels of oil and 190 trillion cubic feet of natural gas in the probable reserves. With these types of assets resting behind a picturesque landscape, it’s no wonder there have been territorial disputes. Speculation that South China Sea tensions could turn into a military confrontation between China and its neighboring countries — and inexorably draw in the United States — are high. Socionomics offers you insights into when those disputes are likely to intensify.